During a recent visit to North America I had the opportunity to meet and talk with a large number of operating room nurses about their thoughts on safety scalpels. For some reason this slightly controversial topic seemed to elicit a range of amusing facial expressions. Delving a little deeper it became quite evident that the vast majority of people I spoke to had similar view on the use of safety scalpels in the operating room. The three main areas of discussion were unpredictable activation, surgeon feedback, and mandating the use of safety scalpels without consultation. Activation rates were a real concern. Two nurses shared with me their personal experiences about cutting themselves with safety scalpels, which they thought were safe to handle. Several nurses also pointed to the fact that the danger is not always visible and it’s easy to assume that the instrument has been disarmed when in fact it has not. The nurses also commented that concentration levels are at their maximum when the danger can be seen as in the case of a tradition handle and blade, as compared to safety scalpel where the danger is not always visible. Imagine this: When you can see broken glass on the beach, you will be more aware of your steps to make sure you are not cut from the broken glass. However, when the danger is hidden, ie, the broken glass is hidden underneath the sand, you may not pay much attention of where you step. This prompted me to do some research on the subject and my research findings alarmingly backed up these concerns. There is no evidence that showed safety scalpels are safer than conventional scalpels especially when used with a hands-free passing (HFP) technique (Fuentes, Collier, Sinnott, & Whitby, 2008). In fact, CDC studies shows that up to 87% of active medical devices are not activated. Safety scalpels are active devices and therefore the risk of not activating is significant (Alvarado-Ramy et al., 2003). See the differences between an active and passive safety engineered medical device here. Based on the above CDC research, Fuentes et al. (2008) shows that combining a single-handed scalpel blade remover and a hands-free-technique (such as a passing tray or neutral zone) is up to five times safer than a safety scalpel. Surgeon feedback was a major talking point and the high percentage of surgeons who constantly complained about safety scalpels was alarming. The number one pet hate is that safety scalpels obscure vision, potentially compromising patient safety. Additionally, many noted the “flimsy” nature of the safety scalpels and the lack of tactile feedback that a traditional scalpel offers. Last but not least, the lack of consultancy and the mandating of the use of safety scalpels is another big talking point. One nurse summed things up quite eloquently when she said, “Who makes these decisions? Why weren’t we consulted? More importantly, why do surgeons’ feedbacks get over looked when it comes to their requirements to perform surgery safely, and in a manner they were trained? The mandate brings up another puzzle as to who benefits from the decision making process. Surely it can’t be based on cost saving, a safety scalpel is more expensive compared to a single surgical blade (handle is reusable). And we have mentioned the lack of supportive clinical evidence regarding safety – so why? I suspect that these decisions are generally made with good intension, unfortunately without understanding the poor safety and surgical outcomes. It is entirely possible that the name “safety scalpel” is a compelling cause for many to act, believing that they are complying with regulations and doing the right thing by staff. However knowing the evidence, we should put up a stronger argument and hard evidences to the decision makers. In this process we need to involve more nurses and doctors where their voices can be heard, to ensure that patient safety, staff safety and surgeon preferences are all well-taken care of. 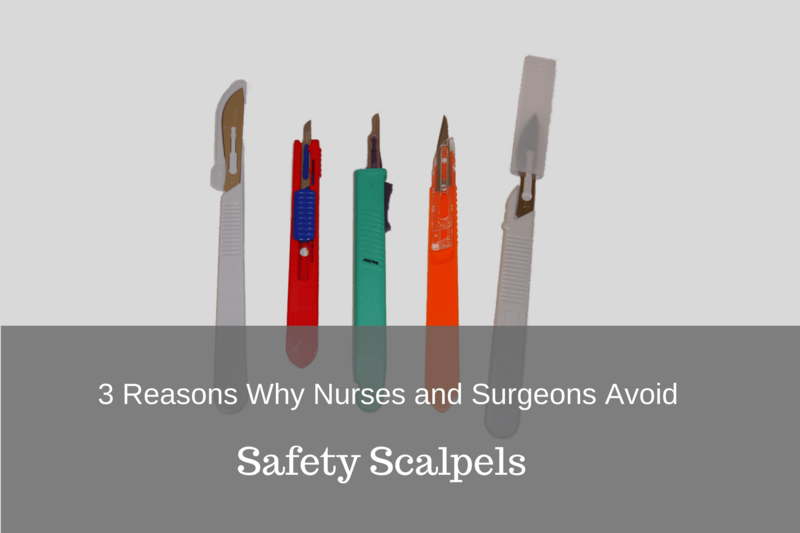 Are you a nurse or doctor who currently uses safety scalpel? What are your views and personal experience with safety scalpels? Dr. Michael Sinnott is an Emergency Physician at Princess Alexandra Hospital, Brisbane, Australia. Having a great passion for staff safety in healthcare settings, he has dedicated himself to increase awareness on the importance of this subject as well as developing new ideas to make improvements in occupational health & safety. Alvarado-Ramy, F., Beltrami, E. M., Short, L. J., Srivastava, P. U., Henry, K., Mendelson, M., . . . Chamberland, M. E. (2003). A comprehensive approach to percutaneous injury prevention during phlebotomy: results of a multicenter study, 1993-1995. Infect Control Hosp Epidemiol, 24(2), 97-104. Fuentes, H., Collier, J., Sinnott, M., & Whitby, M. (2008). “Scalpel Safety”: Modeling the effectiveness of different safety devices’ ability to reduce scalpel blade injuries. The International Journal of Risk & Safety in Medicine, 20(1-2), 83-89. Hwang, H. (2009). Warning: “safety” scalpels are dangerous. . BCMJ, 51(3), 103.